We’re definitely behind what things looked like a year ago today. I’m seeing tulip and daffodil and other sprouts coming up in my yard and other yards as well. Spring isn’t here yet, but it now seems like it’s on its way (which seemed implausible a couple of weeks ago). I just ordered a bunch of seeds from Seed Savers (cucumber, sunflower, calendula, chard, …) and I’ve updated my planting list – now if only we can get more green! After writing the last post, I decided to do a little garden cleanup and composting. I was hoping to see more daffodil sprouts (I did) and some spring ephemeral wildflower sprouts (I did not), but I was not expecting actual flowers! 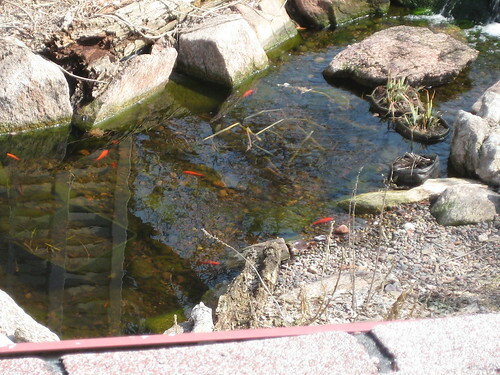 Maybe spring is actually coming…..
No daffodils or hyacinths or forsythia this March, but I do have goldfish! The pond is a bright spot in this so far dreary month. The only string algae in the pond is in the waterfall (where the fish can’t eat it). The fish look big and happy, even though I wish there were more shubunkins among them. 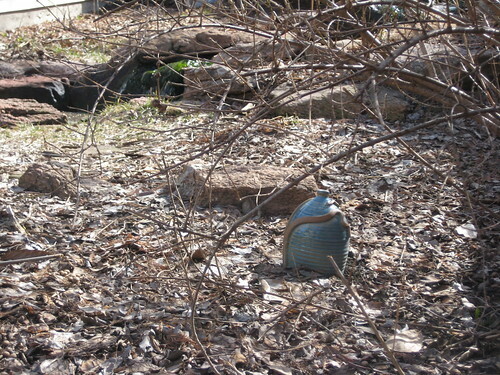 The pond plants are still absent just like the garden plants are, but that’s the way this spring is going. The average low temperature is up to 32 F, so we just need to stop being so persistently colder than average. Who is pruning my shrubs? Annabelle hydrangea before I pruned it myself. 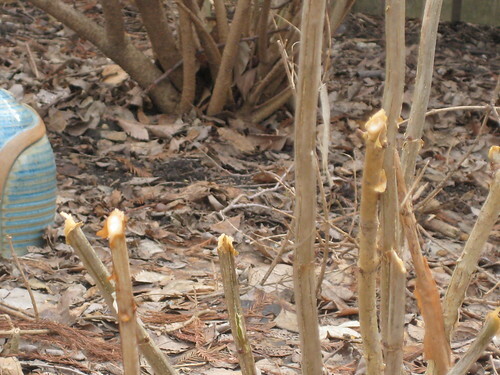 Someone’s been pruning my shrubs over the winter, and it definitely wasn’t me. 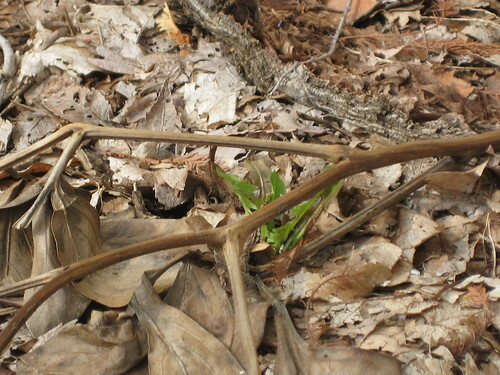 When I first saw all this damage, I thought it might be from the heavy snows we’ve had this winter, but the stems don’t look broken. I don’t prune my oakleaf hydrangeas, but someone does. 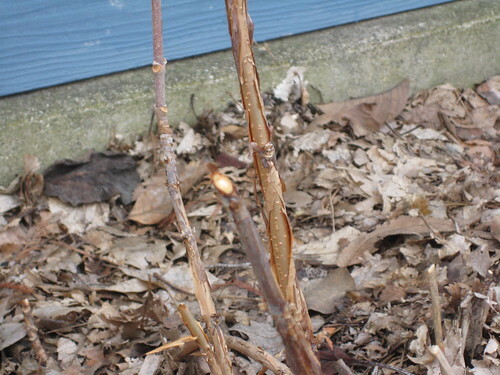 All of my hydrangeas – both oakleaf and Annabelle – show this damage, as does the mapleleaf viburnum. Has anyone else seen this? Do you think it might be squirrels or rabbits? It could even be raccoons or opossums, since we have a large population of those as well. I don’t really care about the Annabelles since they do better with a pruning, but to lose so many branches of the mapleleaf viburnum and oakleaf hydrangeas really hurts. Perhaps everything will grow back bigger and stronger, but I’ll have to wait to find that out until summertime. 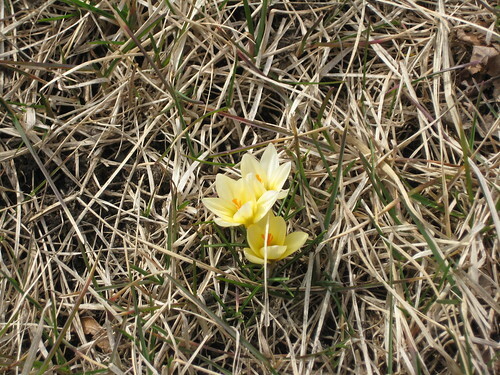 Over three months ago, I wrote about the first sign of spring. I would have never guessed it would have taken until now to see a real sign of spring: a bulb shoot coming up through greening thyme. It’s been a long winter. A more impressive green are the dandelions coming up in the bed just south of the garage. I think this will have to satisfy me for now, even with the equinox tomorrow and the average low approaching 32 F: more cold weather is on the way. 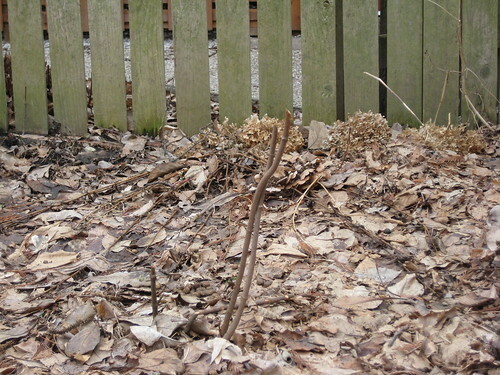 I went out today to see if there might be any green at all in the yard: a daffodil or scilla coming up, some spring ephemerals starting to grow in the sideyard, or even the grass becoming somewhat less brown. Nothing doing: everything looks just the same as it did after the first killing frost of the fall. So my photo taking session turned into alley cleanup (both garbage from the neighbors who apparently don’t understand the whole keeping the garbage in the bins concept as well as bur-filled weeds that survived all the ice and snow) and pond cleanup. At least the fish look healthy! 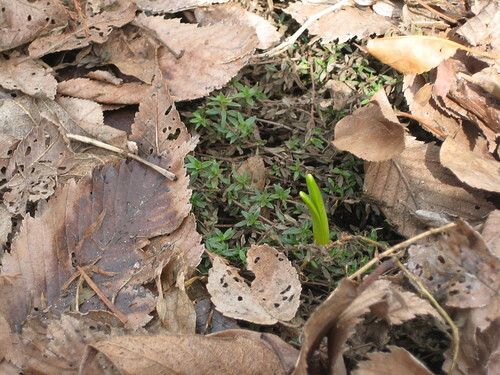 I did find a neighbor (not a littering one) who had some small green sprouts that appear to be snowdrops. It seems ludicrous that it’s nearly mid-March and the snowdrops are just now sprouting. To have it pointed out that it’s now cold lake wind season seems to be rubbing it in….